Maps of the Ancient Sea Kings  by Charles H. Hapgood, is frequently quoted as evidence of an Antarctic location for Atlantis. Hapgood’s study of ancient maps and in particular the Piri Reis Map convinced him that it showed an ice-free Antarctic. It took the Flem-Aths to combine this map with the idea of crustal displacement to develop their theory of an Antarctic Atlantis. 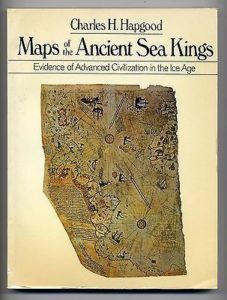 Although Hapgood gives no personal opinion regarding the existence of Atlantis and in fact he only mentions it fleetingly in a single short paragraph, he was convinced that his extensive investigation offered evidence of advanced civilisation during the Ice Age.